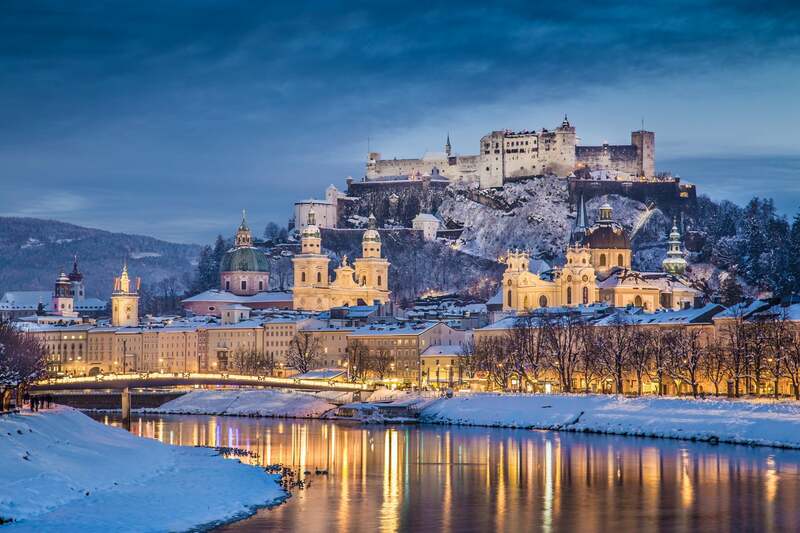 With its backdrop of mountains, hilltop fortress and cathedral-sized beer houses, Salzburg ranks as one of Europe’s most spectacular destinations. It’s also got a number of claims to fame – the carol Silent Night was written by a Salzburg priest and first performed in the nearby village of Oberndorf. It’s also home to the legendary Salzburg Festival, which celebrates its 100th anniversary in 2020. Don’t be surprised if the city looks familiar, either – key scenes from The Sound of Music were shot here. Notable filming locations include St. Peter’s Monastery and Cemetery and Catacombs, and the Mirabell Palace and Gardens, where you can dance around the famous fountain. It’s hardly surprising Salzburg is known as Austria’s Music City. Joseph Mohr, a priest who wrote the lyrics to the carol Silent Night, was born here – visit the nearby village of Oberndorf to peek inside the tiny Silent Night Chapel, a replica of the church where it was first performed on Christmas Eve 1818. Mohr performed it with the church’s organist, Franz Gruber, who wrote the music; Mohr’s former home, a few metres from the Silent Night Chapel, is now the Silent Night Museum. Mozart’s birthplace, in the city centre, is easier to find – the ground floor houses a large Spar supermarket. 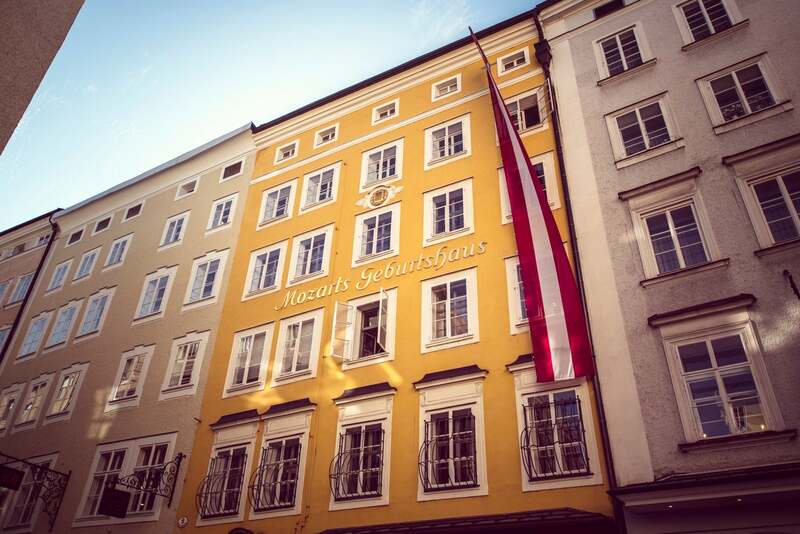 The building has been beautifully preserved, with original wooden shutters on the windows, and the upper floors house a Mozart museum, where you’ll find a priceless range of memorabilia documenting the composer’s life in Salzburg. And, of course, the city famously starred as the backdrop to many crucial scenes in The Sound of Music. 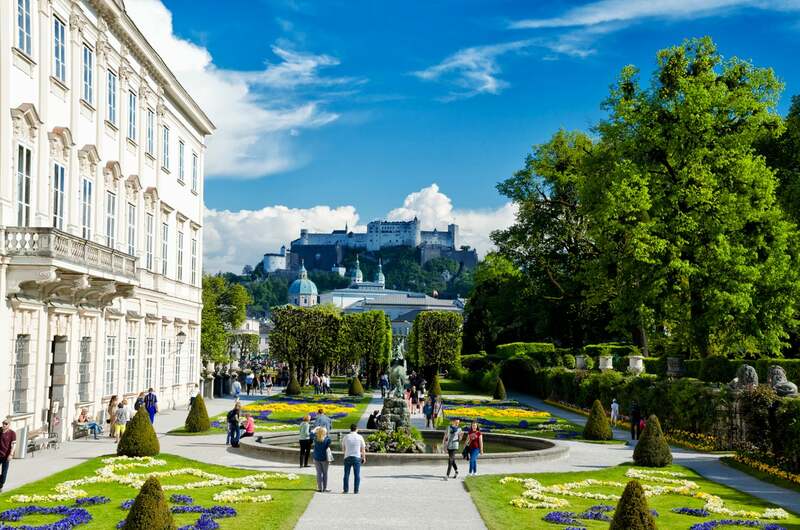 Follow in Julie Andrews’ footsteps on one of the city’s many, many Sound of Music tours – Fräulein Maria’s Bicycle Tours lets you explore filming locations on two wheels (€35 for a three and a half hour tour). The Augustiner Bräu is Austria’s largest beer hall – there’s seating for more than 1,100 people. In warmer weather, nab a seat in the beer garden, which has room for 1,400. Beer has been brewed here since 1621, and the five separate beer halls have ornate fountains, antique chandeliers and original wooden furniture. Part of the appeal is the process of getting a beer, which has remained the same for years: after buying a token, grab one of the huge earthenware steins, rinse it at the fountain, then head to the row of casks to fill it with the good stuff. Make sure you bring cash as cards aren’t accepted. Open weekdays, 3-11pm and weekends, 2.30-11pm. Salzburg is a city built on salt – or white gold, as miners referred to it. One of the oldest mines is the Salzbergwerk Berchtesgaden, a 40-minute drive from the city centre (alternatively, hop on the No 840 bus). Sign up for a guided tour to descend 1,400m below ground level, sail across a subterranean lake and visit the salt cathedral. You’ll also be able to fly down the metal slide which workers once used to access different parts of the mine. Open from 9am-5pm from 1 April to 31 October, and from 11am-3pm from 2 November to 31 March. 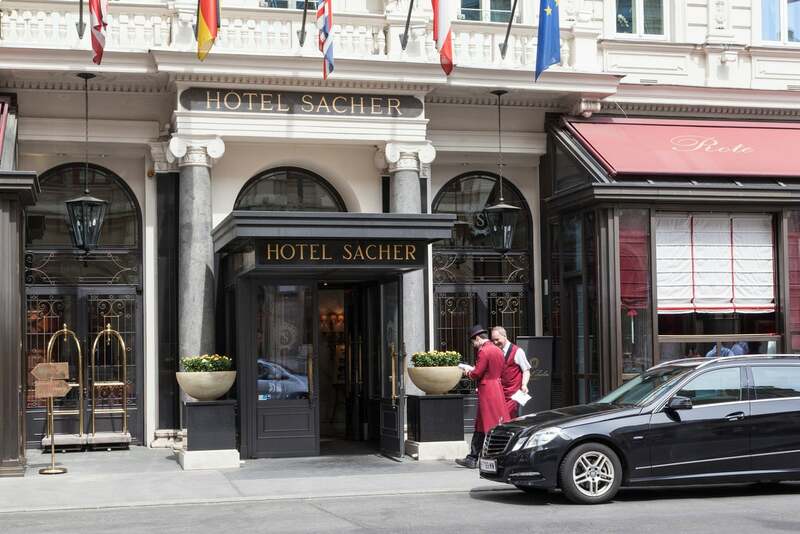 The historic Hotel Sacher Salzburg is the city’s finest hotel – a palatial property with gloved doormen, antique-filled bedrooms and a beautiful 18th-century mosaic in the lobby. Opt for a room on a higher floor for views of the old town and the Mirabell Gardens, the setting for the Sound of Music’s memorable fountain scene. Doubles from €354, B&B. The city centre Radisson Blu Salzburg, tucked inside a beautiful building dating back to 1377, is a more budget friendly option, and enjoys a central location a stone’s throw from Salzburg cathedral. Doubles €148, B&B. If you’re visiting from April onward, book a stay at the soon-to-open Arte Hotel Salzburg, a contemporary city centre property with a gorgeous rooftop bar. Cafe Tomaselli has been run for over 150 years by the same family. Legendary Austrian film director Max Reinhardt was inspired to create the Salzburg Festival while sitting at one of its tables, and today the servers (known as Kaffeedame, meaning coffee waitresses) wear the same white pinafores. The most popular items are the freshly-baked croissants and brioches. Open from 7am-7pm, Monday to Sunday. July will see the highly anticipated reopening, following refurbishment, of the five-star Goldener Hirsch hotel. Head to its restaurant – named after the hotel and housed in a former blacksmith’s – for a blend of international and traditional Austrian cuisine. The venue overlooks the beautiful Festival Hall, one of the main venues for the Salzburg Festival, which celebrates its 100th anniversary in 2020. St. Peter Stiftskulinarium, which dates back to 803AD, is central Europe’s oldest restaurant. You’ll find it in the city centre, within the walls of St Peter’s Abbey. Head here for traditional Salzburgerland cuisine, including cabbage-stuffed quail, wild carp and Tyrolean mountain lamb. 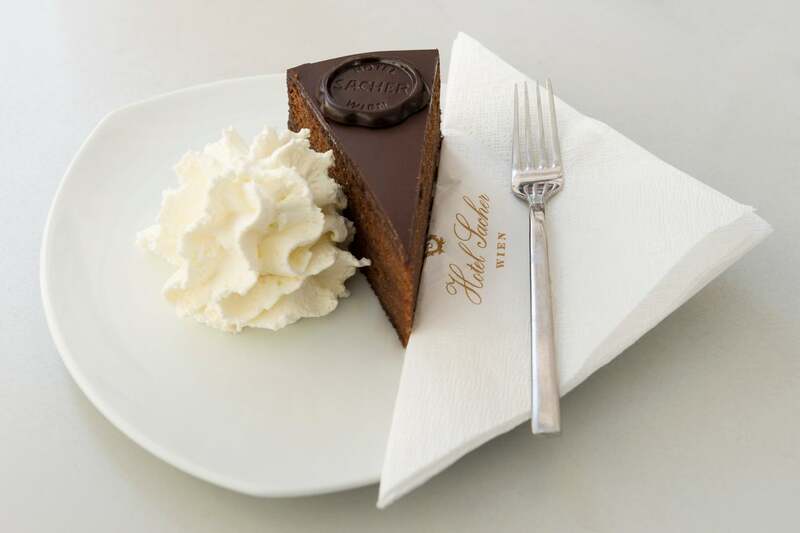 Finish with Salzburger Nockerl, a deliciously sweet soufflé-like dessert sculpted into three soft peaks (it’s a tribute to three nearby mountains). Open from 11.30am-11pm Monday to Thursday, and from 11.30am-midnight Friday to Sunday. the corner of Anton-Neumayer-Platz and the Gstättengasse is where you’ll find the city’s liveliest clubs. Some of Salzburg’s oldest beer houses are in the narrow streets surrounding Residenzplatz, the main town square. 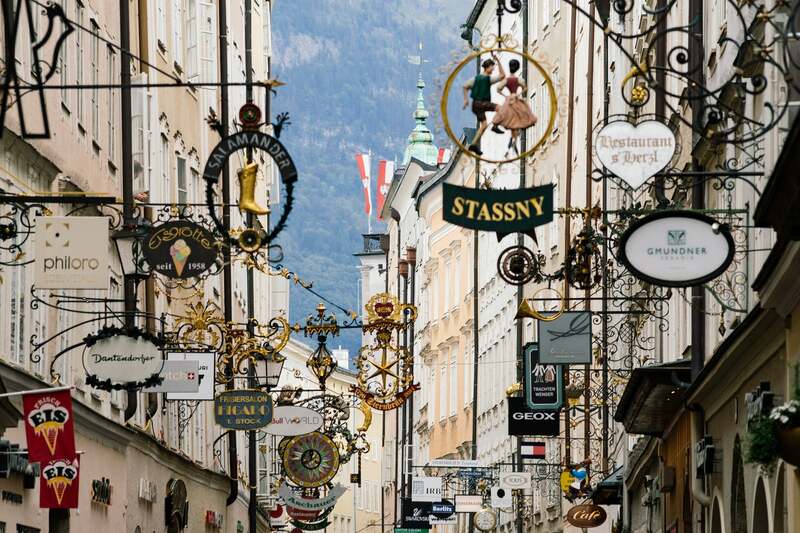 Getreidegasse is the elegant main shopping street, as well as one of the city’s oldest. Centuries ago, when not all of Salzburg’s residents could read, wrought-iron signs indicated the nature of businesses – a leg of lamb for a butcher, for example. Today, tenants must maintain the street’s appearance, which is why the McDonald’s has a beautiful, curved wrought-iron “M” outside. Getreidegasse has the biggest high street brands, along with some of the city’s oldest shops, including Kirchtag, an umbrella store which dates back to 1903. The store’s handmade umbrellas, which can be engraved and personalised to match certain outfits or for special occasions, retail for around €250. The street’s most colourful store is Staindl’s Handgemachte Delikatessen, where you can find over 120 types of marmalade made with everything from walnuts to papayas. 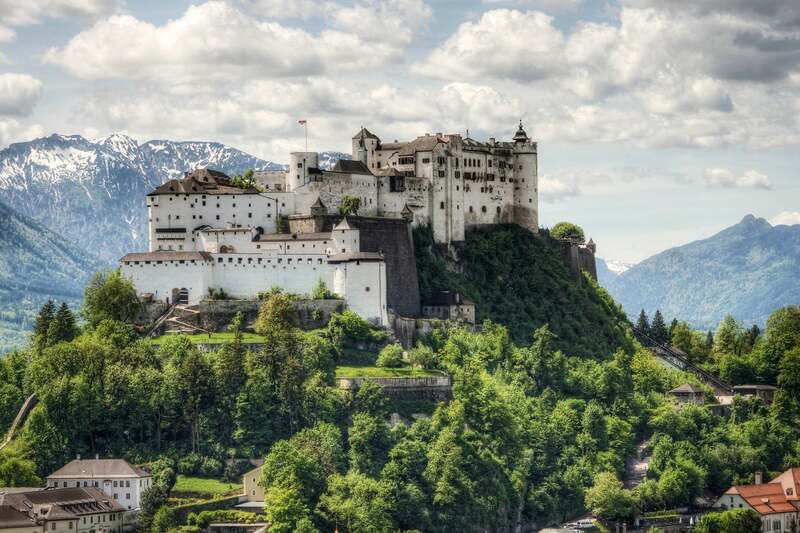 The Hohensalzburg Fortress, the largest fully-preserved castle in Central Europe, towers over the old town. It dates back to 1077 and comprises a cluster of buildings – some of which have now been turned into museums, including, from this summer, the Altes Zeughaus, which takes a closer hook at the design of the fortress and the canons used to defend it. Head here for breathtaking views over the city, and to walk off those steins of beer – it’s a steep, 20-minute walk, or you can hop on the funicular (one of the world’s steepest, and Austria’s oldest). 10 per cent in restaurants and for taxis. In bars, round up to the nearest euro. Salzburg’s size means the city is best navigated on foot. Look out for the city’s so-called stumbling stones – cobblestone-sized brass squares built into the city’s streets. The concept was created by German artist Gunter Demnig, who came up with the idea of using engraved brass squares as a way of remembering victims of WWII. There are over 356 in Salzburg, with more added every year. These include the stumbling stone at Max-Ott-Platz, dedicated to Andreas Rehrl, who died while trying to defuse a bomb in November 1944.